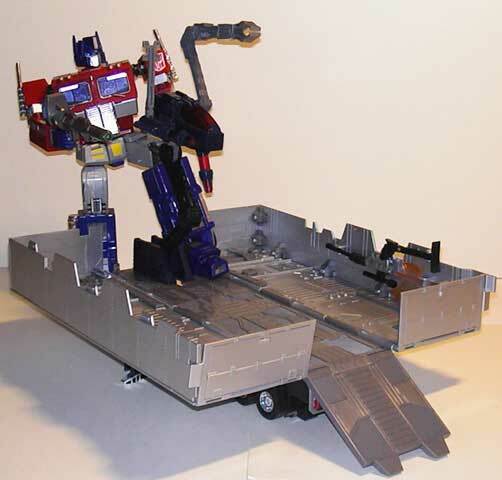 There is very little that can be said about Optimus Prime that hasn't already been said. Although some might say that he is universally loved, I am fully aware of some individuals' disdain for his character (least of which is his inability to stay dead). 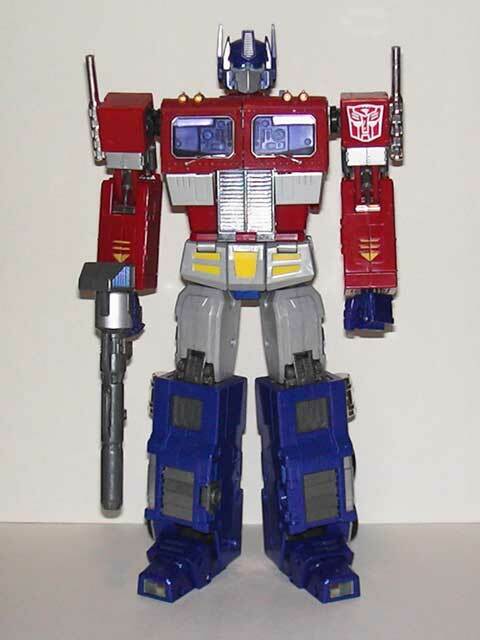 Regardless of that minority, it could be said that Optimus Prime IS Transformers; in almost every single Transformers cartoon, there has been an Optimus Prime of some kind - red truck, futuristic red truck, red fire truck, a gorilla, a lion...the list goes on. However, of all these, the most widely recognized one of these is the original; namely the cartoon rendition. Along with, oddly enough, a few Decepticons, he is the most recognized character of the franchise. There is no denying that fact - there aren't many places in the world where you can show a picture of him and NOT have people recognize him as Optimus Prime (or whatever he is called in the corresponding country). There is also very little that hasn't already been said about this toy. Takara and Hasbro have really exhausted the mold, which is really no surprise since Masterpiece Convoy IS an engineering marvel of it's own. The mold has been used at least five times now: first there was MP-01 with 20th Anniversary Prime corresponding as the US release of the toy, plus the compulsory white repaint from Takara's behalf; and now The 20th Anniversary DVD edition of the US toy, which is very little different from the original 20th Ann. Prime, while Takara goes to offer something truly new to the toy. Primes is packaged in a large black matte-coated cardboard box with gloss used for some details. The box is 15.6x15.7x5.5 inches, so it is roughly equivalent to the PM Prime reissue box in size. 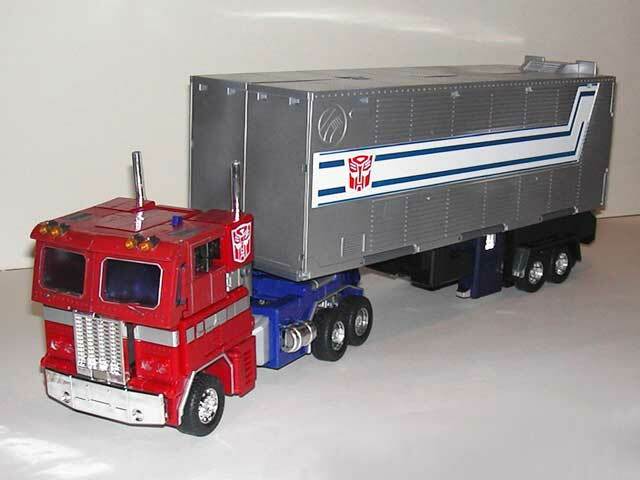 The front of the box is dominated by a picture of Prime in his truck mode, hauling his trailer, with another picture of Prime in his robot mode watching from above. The robot mode shot used appears to be the same as was in the original box, but you can only see upper half of his torso because of the truck mode shot. The bottom of the box shows the current line-up in MP line, and the back of the box appears to carry much of the same information as the original MP-1 box, with the addition of the trailer. Inside the box there are two additional white boxes, one with Prime himself inside and one with the trailer. Prime comes packed in robot mode and...okay, here comes the bit where I can't think of anything to say because it's all been said already. There have been several toys of Prime that have imitated his instantly recognizable cartoon appearance, but none of them have been able to transform...until now. And I'm taking my hat off for Takara for achieving such a feat. And what a feat it is! Naturally this means that the transformation scheme is no longer a simple matter of flipping legs, toes, arms and head...although those moves are still here, there's a whole lot of else going on, especially around the torso area. Standing at about 11.6 inches tall, MP Convoy is not only tall but heavy as well. His chest uses plenty die cast material, and the blue parts that are his legs are entirely made of die cast as well, except for his feet, making him one imposing bot. The proportions in his bot mode are nothing short of perfect; he has no body parts that seem excessively large or small, everything is spot on. He's got amazing amount of detail; lot of which would have been (and was) done with stickers in the original toy, are actually molded and painted here. His eyes use vacuum-chromed blue to make them look almost as if they were light-piped. He has an Autobot symbol only on his left shoulder, just like in the movie. His smokestacks are also chromed, and they swivel inwards a little, minimizing the risk of snapping them in two. His chest-windows are partially transparent, exposing the plate inside, but more about that later...he also has tiny windshield wipers molded in. The front grill is chromed...now, the original toy had the front bumper becoming his crotch, but the cartoon model looked nothing like that, so MP Convoy's hips hardly look like a bumper either, although they do have yellow highlights just like the cartoon model. Prime's got a whole lotta articulation too; ball-jointed neck and feet, and a whole lotta other joints that work almost like ball-joints, giving him a broad freedom of movement. He turns at waist, his knees and elbows not only bend but also have facsimile hydraulics to give that necessary extra detail. Although his knees use copious joints to allow them to bend almost in half, his elbows only bend up to 90 degrees. He also bends at toes, and I tried to put him in a "Keep on Truckin'"-pose, but the die cast made him too heavy and imbalanced for it. I have only two gripes; one is the fingers, which are only jointed at the fist, causing them to be in a permanent 'hooked' position, a problem both Armada Unicron and Cybertron Primus didn't have...although neither need to hold any guns, whereas Prime does, so it is acceptable. The other is the die cast; despite giving the character imposing weight and appearance, the paint scratches off a bit too easily. Most annoying. Starting up top, a button in the back of his head makes his faceplate move. 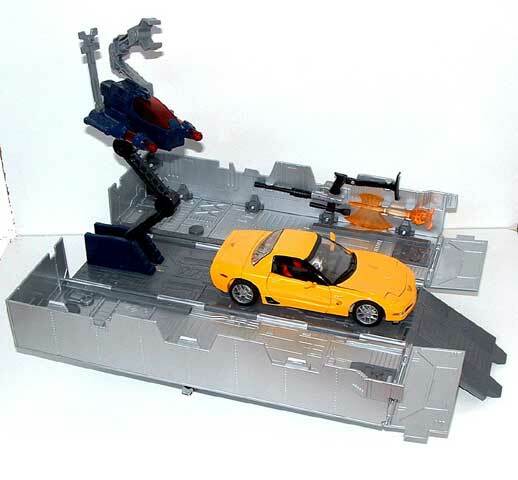 A similar gimmick was also seen on Armada Super Prime, but thanks to the figure's much larger size, it is achieved here to much better results. Some have said that he has a mouth behind that faceplate: I can confirm this. Albeit I didn't just pull it off, looking behind it one can see what looks like the mouth that was seen in the US issue #76; it isn't really a mouth, just a grid of some kind. Moving down...the biggest gimmick on the entire toy (other than transforming and having a hell lot of articulation, obviously) can be found inside his chest; pull open the windows, flip up the plate beneath...and you will find the Matrix of leadership. Pushing the blue button right next to his head lights it up too, and let me tell you that this really DOES light up your darkest hour; the thing is brighter than most flashlights! The Matrix can be removed but is really snug fit, but fortunately the chrome can take a fair share of punishment without scratching off. The Matrix has chromed handles with a golden container, and it can be pulled apart to expose the translucent blue piece that appears "floating" between the two halves of the container. On both wrists there are flip-up communications panels, but unlike in the original, the faces have been changed; instead of Starscream and Bumblebee, Prime can now keep up tabs with Megatron or Grimlock. It's a kind of shame Takara didn't supply a whole sheet of stickers so you could have whoever you wanted, but it works this way too. At least he no longer has to talk to his most inept opponent. Finally, a gimmick that was never seen in any media but was included anyway, are on his legs; pushing his feet up into his legs cause the grey vents seen on the front flip open, as if cooling down. This is a gimmick that wasn't really necessary, but is yet another detail that gives the toy character. Although the vehicle mode was obviously the secondary priority upon creating this, it does not disappoint, at least much. Although the robot mode's hips are clearly visible behind the cab, and the windows protrude slightly beyond the headlights, this is nowhere as bad as THS-02, and definitely not as awkward-looking as the Classics Optimus Prime from the Prime vs. Megs 2-pack. For one thing, this big red rig is nicely in scale with itself, and looks great next to your Alternators/Binaltechs...at least, I THINK it would, as I do not own a single one. Yet. Again, there's a nice level of detail visible here, but I should probably tackle on the details not previously visible in robot mode (and thus not handled in it's respective section of this review). First of all, the front grill is not the same one that formed the robot's belly; that one is under the truck, right between the front tires to be exact. The bumper is actually the plate covering the Matrix in robot mode, and this displays the imagination the designer of MP Convoy had in use of various parts for another purpose in the alt mode. If you really want to put thought into it, the Matrix is essentially located where the engine should be; a very nice touch. As far as the gimmicks go, there aren't nearly as many in this mode. Opening those front windows, you can see the back of the driver's seat...place in the middle of a cockpit, and having absolutely no interior detail beyond that, you'll have to settle with a Lego figure for a driver. The remaining gimmick is that all six wheels in the truck mode have working suspension. Now, the only thing that keeps this from working right is the fact that the front and the back of the truck are die cast connected with plastic, namely the hips I mentioned, giving this truck slightly flimsy feel; you'll want to pick it up with two hands. Or should I say lift? It's that heavy. Since you've probably read every review of the Masterpiece Convoy or 20th Anniversary Prime out there, you probably just skipped my less than stellar review of the actual toy and just want to read up on what new this version offers. I do not hold it against you; I would probably do the same. The booklet from the original has also been updated, with information of the trailer, but the 'Aspects of Convoy' section, which chronicles the character's history in toy format, has been drastically reduced. The catalogue only shows the first and the last Primes of both G1/G2 and Beast Wars era, with the odd exceptions of Rodimus Convoy and BW Neo and BW II Convoys. However, the list now includes post-Armada Primes as well, although it skips Superlink Prime altogether and shows only Omega Prime, and for some reason it lists all the good Convoys from Galaxy Force and even the Reverse Convoy from RobotMasters line and KISS Convoy. But what you REALLY wanted to know more about is, of course, the trailer itself. There have been many custom and bootleg trailers, but having no personal experience of those except for the pictures I have seen, I cannot really compare the quality. Attaching the trailer on Convoy's truck mode brings the vehicle mode length close to whopping 19 inches long. Just like Convoy himself, the trailer has striven to be different from the original, but strong sense of familiarity. The huge, boxy trailer looks like...a huge, boxy trailer. Although the familiar blue & white striping on the sides is different from the original toy, this is well in context with Convoy himself who really doesn't look like anything like the original toy. In fact, I don't even remember seeing the blue stripes in the original cartoon? The stripes have slight chiseling for better definition, and the familiar Autobot logo is still there as well, and it isn't just a flat decal, it's actually molded in. Cool! The back doors of the trailer open to reveal a ramp, fold it down and the inside of the trailer is big enough for an Alternator/Binaltech to hitch a ride. 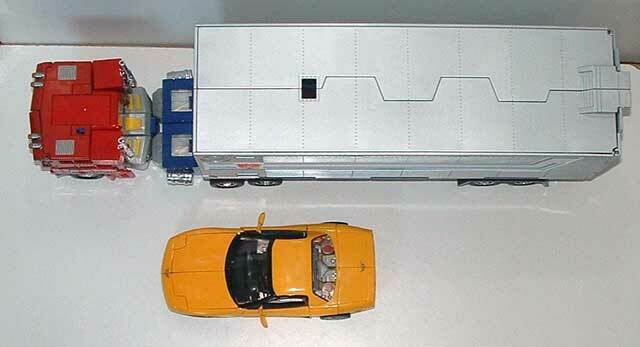 There is a rod beneath the trailer on which there is a peg to plug into the back of Convoy's truck mode. The rod also folds down to support the trailer on it's own, and there are two wings that fold out and extend for additional support, although these serve the base mode best. The struts that slide down are chromed plastic and they have absolutely no detail on the backside, meaning the fact that they are hollow is made painfully obvious when you swing them out. Just the like the original toy, the trailer folds wide open for a base/repair bay, and this feature was used sparingly in the cartoon as well. There is no painted detail inside however, all is covered in molded tech detail. There are some darker grey extra parts glued in for extra detail. Since there is no Roller, the spring-loaded launch mechanism for it is gone. However, that familiar...uh...tower-thing with guns and a grabby claw and some antenna-thingamajig is still there, complete with an opening cockpit (but who would man it?) and a handle in the back for Convoy to grab on. Just like the original trailer, this one too has a hole on top for the tower to stick out from. Another cool feature is that rather than having Convoy's accessories just lie around in the trailer, the walls (the roof in trailer mode) have little slots to store his gun, energon axe and even the mini-Megatron. My biggest gripe with the trailer is that how fragile/flimsy it feels. It just isn't the same level of quality as Prime himself, rendering the "official" trailer almost on par with the custom one. Of course, what else can you expect from what is essentially a huge, hollow piece of plastic? The huge hinges all over the trailer feel really awkward once the thing is open, and the extending repair unit strut is kind of limp. It's ratcheted, but it has too much room to wiggle. The only thing that draws away from the 'Perfect Edition' title however, is the absence of Roller. So is the "official" trailer worth it? Well, if you do not already have any version of the toy, I would say MP-04 is the best choice. Although many were upset when Takara decided to re-release Convoy with the trailer but not issue the trailer separately, there are those bootleg trailers I mentioned, but there is one that doesn't even open up and the one that does is a scaled-up version of the original, and although it does have Roller and the spring mechanism to launch it, I do think the giant stickers look awfully tacky. However, MP-4 does not come cheap, and carries a hefty price tag. The trailer may not match Prime in the Masterpiece quality, but I still think it looks a lot better than that bootleg one. Transformation: 9/10 - Complex but relatively easy to master. Certainly nowhere as time-consuming as Masterpiece Megatron. Durability: 7/10 - The trailer feels rather flimsy, but Prime himself is durable as a brick; the ease at which the shoulder logo and die cast paint chips and scratches, on his torso in particular, drop the score severely. Mine is already full of spots with the dark grey die cast exposed. Fun: 9/10 - It's rather difficult to call this "fun", since Masterpieces are closer to collectables than toys. However, the trailer adds a huge deal in the fun factor, thanks to the whole aspect of being able to interact with Binaltechs/Alternators. Price: 5/10 - Almost twice the price for the addition of...trailer? No wonder so many people have opted to go for the bootleg version, despite my personal opinion that the giant stickers make it look awfully tacky. At least the official trailer has storage slots for all of Prime's accessories. Overall: 8/10 - Hmmm. If you already own the original version, I can't really say this is worth the update. If not...well, the red paint on his torso chips so ridicilously easy, but having never owned the original version, I can't say how different it is.